Investments in Austria’s real estate are very attractive alternative for investors today. Having a lot of advantages, owing apartments in Austria also has some specifics, especially from a legal point of view. Investor shall know about those specifics in advance, in order to prevent losses and legal proceedings. Investments in Austria’s real estate are very attractive alternative for investors today. Having a lot of advantages, owing apartments in Austria also has some specifics, especially from a legal point of view. Investor shall know about those specifics in advance, in order to prevent losses and legal proceedings. Such legal aspects will be considered in this article. When representatives of Benesteem company meet in Austria or Switzerland with clients or potential investors, who are new to real-estate investments in Central Europe, they often relive the same scene. The plan includes visiting selected investment objects, such as office space in the business districts of Zurich or Geneva, a residential property in one of noble spa resorts or luxury holiday apartments in a famous alpine ski region. And when investor is told that this building is 130 years old, that office complex was designed by a famous Swiss architect in the 1920ties or that chalet was built by a German industrialist 50 years ago, the response is only disbelieve and shaking the head. "The building is in perfect condition, it must be new, it's only designed to look old-style" is the standard comment what usually heard. 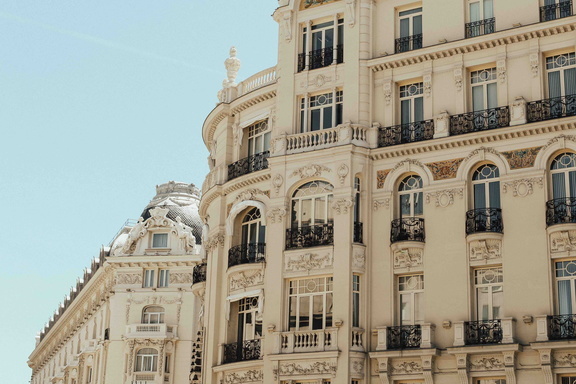 The fact is that good structural quality, permanent maintenance and improvements of the building, and powerful laws on real-estate property lay the foundation for the long-term quality of real-estate investments in Central Europe. Austria, with a political, geographic and economic situation similar to Switzerland, but a more relaxed price level (at least for now...), offers especially interesting opportunities for securing your wealth through real-estate investments. The ownership of an apartment, no matter whether for residential purposes or for holiday lease, is governed by strict federal laws in Austria since long time. These laws regulate almost every aspect of ownership rights and duties, and they are binding for each and every owner in an apartment building. It shall be noted that the laws on apartment ownership are quite similar in Austria, Germany and Switzerland and based on the same set of legal principles. However, the situation in the Anglo-Saxon jurisdiction (Great Britain, USA, Australia) is in important aspects totally different from that in Central Europe. Generally speaking, Austria has much more stronger rules on property management and maintenance of the building structure, and gives owners a much stronger position in their land ownership rights than in the Anglo-Saxon countries. The ownership of an apartment is called "Wohnungseigentum" (= residential ownership) in Austria and Germany. This term applies always, no matter whether the apartment is used for ownership occupancy only, permanent residential lease or part-time touristic lease. The legal foundation about flat property is set in a federal law called "Wohnungseigentumsgesetz" (= law on residential ownership), short WEG. This law exists in Austria since long time; its current version dates from 2002. It is binding for all owners of flat property, and also sets the rules for the management of the apartment buildings. 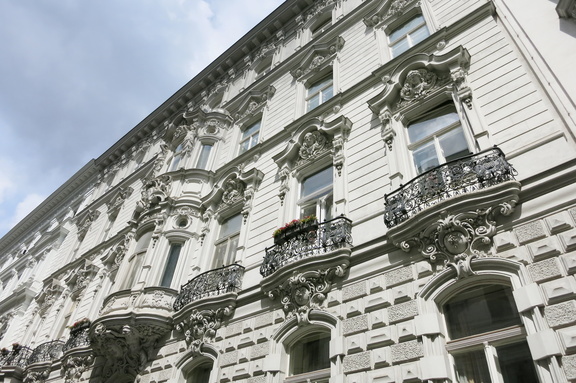 If you buy a flat property in Austria, you as an owner are subject to this law automatically, without the need for any special clause in the purchase contract. A flat property under Austrian law consists of a combination of several ownership objects, which are connected to each other, and are registered together in the land register folio ("Grundbuchblatt"). 1. The apartment itself (defined in WEG §2.2, which must be a complete and self-contained part of the building, large enough and generally suitable for residential purposes under Austrian standards of living. That means that a single room within a large flat cannot be an apartment in the sense of WEG. It must have at least a bathroom, some area for cooking and a lockable master entry door, which separates the whole apartment from others in the same building. It doesn't matter whether the apartment is actually used as a permanent residence or for touristic leasing (holiday homes), it is only important that it could be used for living, given its size and characteristics. It is also possible to treat an office space inside a commercial building or a shop under the rules of the WEG, as long as it is self-contained and large enough to be used as an independent economic unit. 2. Additional parts of the building or pieces of the estate, which are not physically connected to the apartment, but are for the exclusive use of the apartment owner. This can be a cellar, a parking lot in the underground garage or a garden on the building's estate. These objects are called "Zubehör-Wohnungseigentum" (residential ownership accessories, defined in WEG §2.3). 3. A co-ownership ("Miteigentum", WEG §2.5) of the building, inside which the apartment itself resides, and also infrastructure installations, which are designated for common use (central heating system, lift and so on). By this co-ownership, not only rights of usage are established, but also duties originate for the apartment owner. Most prominently this is the duty to pay regularly for the maintenance and repair of the building structure and its infrastructure. The concept of building co-ownership and the collective duty for structural maintenance, which stems from this point, is an important cornerstone of apartment ownership laws in Central Europe, an differs considerably from laws and practices found in Anglo-Saxon countries. In those jurisdictions, the building structure and the land it's build on (the so-called freehold or enfranchisement), can be owned by a third party, namely a construction company or a local landlord, and the flat owner has only the right to use the apartment itself. The Anglo-Saxon scheme allows a lower initial purchase price for the apartment buyer in the first place, but can lead to a rapid depreciation of the flat property and to a lot of practical problems, if the building is not maintained properly. 4. A co-ownership of the plot of land, on which the apartment building is build. This element of Austrian flat property law (WEG §2.5), which exists also in the corresponding laws of Germany and Switzerland, cannot be underestimated. Land, unlike a building, cannot deteriorate (unless we consider catastrophes of landscape-changing dimensions such as the explosion of a nuclear power-plant), requires no maintenance and is not subject to technical depreciation. For investment purposes, the portion of land which is connected to a flat property, is an important factor to consider. It is this element which provides a major share of capital protection, and banks carefully evaluate the land ownership factor ("Miteigentumsanteil"), when they calculate the intrinsic value of a flat property. Let's look at an example from one of real-estate projects: We have 2 holiday apartments of the same size (each about 100 m²), offered to us at approximately the same total cost of investment. One is located in a 3-party chalet-type house, sitting on 869 m² of land. The ownership factor, which is in Austria expressed as a fractional number and recorded in the official land register for every flat property, is 111/255. The other one is located in a large apartment building with 24 flats, build on 3374 m² of land, and has an ownership factor of 212/4744. The price per square meter is approximately the same for both locations. 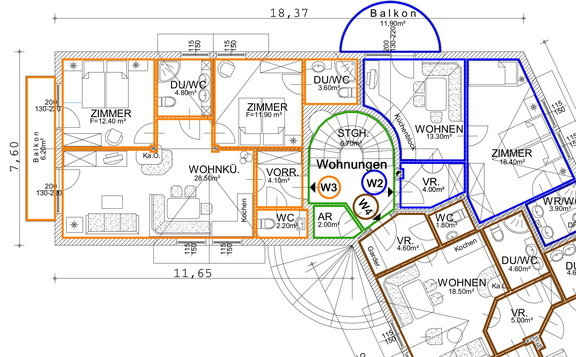 Simple mathematics show that the land portion of the flat property is in case of the chalet-type house 378,3 m², and in case of the large apartment building only 150,8 m². So, the intrinsic land value of the smaller property, sitting on a much smaller plot of land, is 2,5 times higher than that of the larger property, because of the effects of the ownership factor. Every flat property in Austria consists always of the ownership objects No. 1, 3 and 4, and if there are any accessories, then also of objects of type No. 2. They are intrinsically tied to each other. That means if you buy a flat property, you will also get co-ownership of the building structure and the plot of land, with all rights and duties connected to it. It is not possible to separate one of the objects from the others, let’s say the land from the apartment. However, if you own accessory objects, like a cellar or a piece of garden, and you don't need it any more, there are several possibilities to sell them to other owners or lease a rights of use to a third party. All owners of a flat property within a building constitute an owners association ("Eigentümergemeinschaft") by law (WEG §2.5, §18). This owners association is a legal entity of its own. You can think about this like a little firm, with the lucky exception that it must not pay taxes. The owners association as a legal entity is the owner (in legal terms) of the building structure, its infrastructure installations and the land, on which the building resides. However, it cannot sell any of these assets, it can only use, manage and maintain them. If you buy a flat property, you automatically become a member of the owners association by law. You can compare this like becoming a shareholder of a company; the number of "shares" is calculated according to the ownership factor of your flat. The main duty of the owners association is to accumulate the maintenance repair fund ("Instandsetzungsrücklage" or short "Rücklage") and to decide on necessary repairs of the building itself and its infrastructure, or on future improvements or upgrades of the estate (building a swimming pool, improving energy efficiency etc.). The maintenance repair fund (WEG §31) is the main financial asset of the owners association, and its money is designated to pay for future repair and maintenance costs of the estate. It is not intended to pay regular operating costs like garbage collection, building insurance, communal taxes and so on. The concept of this fund is to ensure a continuous, professional maintenance of the building, and that repairs, even unforeseen ones, can be done in time and without extraordinary financial burdens to the individual owners. Owners are obliged to make regular, monthly payments into the maintenance repair fund according to the ownership factor of their flat. How much money is accumulated each year in the fund can be set by a decision of the owners association. However, WEG §18.1 dictates that this amount must be appropriate ("angemessene Rücklage"), that means it cannot be too high or too low. What is appropriate is routinely decided on the base of the so-called Peters' Formula, which was developed by the German architect Peters many decades ago. Investment company Benesteem also uses this formula when calculates the rentability of a certain real-estate investment project. The money of this fund must be held in a so-called segregated account, that means on a special bank account opened exclusively for the owners association. If an owner sells his apartment, he cannot request a refund of his share from the maintenance repair fund. His share of the fund is linked to the property itself and will be transferred with the ownership of the flat to the new buyer. But this also means that the new owner will be held liable for any arrears of the old owner against the owners association. So, should the previous owner be overdue with payments to the fund, the new buyer is responsible for the payment of the arrears. As payments to the maintenance repair fund can be quite substantial, given the high structural value of buildings in Austria and Central Europe, a potential buyer must carefully check the amount of the fund and any possible arrears of the previous owner, before signing the purchase contract. The institution of the owners association with its ownership rights to the building structure and the land, and the powerful instrument of the maintenance repair fund are the proven success factors for long-term investment in flat property in Central Europe. This is in stark contrast to the situation in the Anglo-Saxon jurisdictions, where often the flat property consists only of a right of usage ("leasehold flat"), while the building and its land ("freehold") is owned by some other company. That scheme not only is a permanent source of conflict, but also can result in poorly maintained properties, as the land owner has limited incentive to put his money into repairing or even improving the building structure. Only some years ago, Great Britain introduced a new legislation ("commonhold flat"), which tries to copy some of the well-proven elements of German and Austrian/Swiss laws on flat property. However, this law is voluntary, and the developer of a real-estate apartment project is free to decide whether he will use the traditional leasehold/freehold model or the new commonhold scheme. The decisions of the owners association are made by votes in the owners assembly ("Eigentümerversammlung", WEG §24). In this assembly, each owner has voting rights according to the ownership factor of his flat. You can compare this to the shareholders assembly of a corporation. The owners assembly must be held at least every 2 years (WEG §25.1), however a qualified minority of owners (at least 25%) can demand that an extraordinary assembly will be held at any time. In practice, it is common to hold an assembly once a year. An owner can give a power of attorney to a trusted third person, if he doesn't want to attend personally. If you own an apartment in an Austrian ski resort, you can authorize a lawyer, your asset manager or any other trustworthy person to represent your interests and vote on your behalf in the assembly. The WEG distinguishes between simple majority, two-thirds majority and unanimity, depending on the importance of the decision. It should be noticed that if a case requires unanimity, e.g. for giving somebody special usage rights on some parts of the property or some substantial modification of the building, and not all owners were present or represented at the assembly, the manager of the property (see next chapter) must ask the missing owners for written acceptance of the decision. Unanimity in the sense of the WEG means unanimity among all owners of the estate, not only among those owners present in the assembly. This is one of the many elements of the WEG to protect the rights of minority owners. The proceedings of the assembly and the decisions made must be recorded in a written protocol (WEG §25.3), which must be sent to all owners by postal or electronic mail (WEG §24.5). Before buying a flat property, you should read and examine these protocols carefully, as they can contain clauses and decisions, which might be binding for you in the everyday use of your new apartment. These protocols also can give valuable insights into planned future repairs or improvements of the building, possible conflicts among individual owners and the general situation in the owners association. Of course, these protocols, like all documents connected to your flat property, are in German language only in Austria. Benesteem company usually analyses the protocols for at least the last six years, when it consults clients on real-estate investment in flat properties in Central Europe. Usage agreements ("Benützungsregelung", WEG §17; "Gemeinschaftsordnung", WEG §26) and house rules ("Hausordnung") are written agreements of the owners association. They set binding rules on how to use the common property of the estate and can set limits in the way you use your own flat. Usage agreements and house rules are optional. However, if they exist, investor must carefully check for such agreements, before deciding to buy. Usage agreements must be passed by a unanimous decision of all apartment owners. They can govern long-term matters of usage, such as permanent usage rights for certain parts of the garden, usage of the underground parking and similar topics. They can also set rules and limitations on the way you use your flat property. For instance, in a purely residential estate it can be banned to establish a cafe or a shop in one of the flats, if all owners agree on this. Usage agreements have a binding effect like a law. In most cases, they are recorded in the land register folio of the estate (WEG §17.3), but this is not absolutely mandatory. House rules regulate day-to-day affairs of the community, e.g. whether and when it is allowed to use a barbecue on the balcony, whether pets can run in the gardens, the schedule for cleaning the staircase (if this not done by a housekeeping agency) and so on. House rules can be set and changed by simple majority of the owners assembly, and they must be obeyed by each owner and his tenants. Aspects of owing apartments in Austria are integral part of investing into real estate in this country. This is why they shall be carefully analyzed before making investment decision. Besides aspects described above there are also a whole range of measures aimed to protect rights of minority owners, administrator functions and obligations on repair and maintenance of building with flats, which are important moments of Austrian law in regards to apartment ownership. These aspects will be reviewed in details in our next article. If you want to get more information on this issue you can click “Ask the experts” button below.